Art is a complete reflection of an artist. My work reflects my innerself. I use a wide range of elements in my art. The current works are made of resin. People have very little idea about resin. Resin is like liquid glass, it is transparent or made opaque by mixing a range of different mediums. Once it is set it dries like plastic. The photos of my work will never be able to compare my original artworks. Resin is the most difficult medium that I've ever worked with to create art. I hope people recognize resin as a serious medium with great potential. I hope they fall in love with it too,just like I did. Life is ebbs and flows of hope, strength,love,faith and determination to bring change. I am a self taught Indian artist, holding no professional degree in art,relies only on my passion to creat art. My medium do full justice to my statement. My paintings represent the wonders and intensity of life. These ebbs and flows of currents reflect the opportunity to grow and improve with the challenges we experience each day. 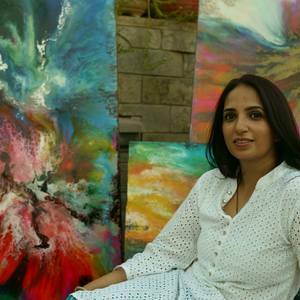 Each painting of mine is a quest to find one's innerself by surrendering to the flow of life.